it cannot have escaped your notice that the average member of the pelotonese has an intrinsic need to stand out in a crowd. 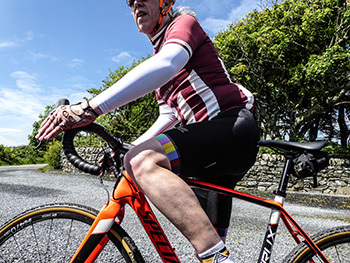 i do not intend to suggest that we are, by nature, either narcissistic or ostentatious, but it's hard to deny that dressing in brightly coloured polyester and lycra on a sunday morning is hardly the behaviour of the shy and retiring. but it gets worse, for not only exists this need to be noticed, but it seems we also have a needy predilection for standing out amongst those who already stand out. to place this theory (which, as related by john cleese, is mine) in a more relevant context, imagine the anonymity of pelotons all across the country dressing in precisely the same colour of jersey. for starters, the comic's weekly club feature would be a tad less interesting. the need to belong is often expressed by way of the ubiquitous club jersey, allowing the demonstration of a collective membership in a dye-sublimated tribal fashion. those of us in the velo club, despite our minimal numbers, are no different. 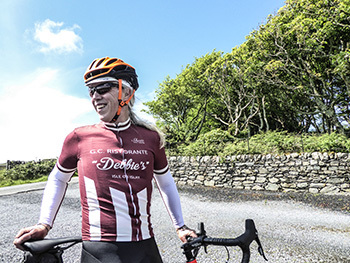 historically speaking we originally demonstrated an adherence to the amber nectar originating at ardbeg distillery, principally because they had eventually caved in to our repeated requests for an ardbeg cycle jersey. however, since none of us live within even shouting distance of the old kiln pagodas, we subsequently transferred allegiance to debbie's café in bruichladdich, a little closer to home for the majority of the peloton. this was outwardly expressed by way of the highly acclaimed welcome to great coffee jerseys. but, as bob dylan has occasionally mentioned, the times they are a-changing and we are not ones to dispute the philosophies of mr zimmerman. thus, inspired by an italian vintage wool jersey, the decision was made to commission the extremely helpful chaps and chapesses at shutt velo rapide to produce a verisimilitude of that italian jersey, fashioned in the colours to which we had become accustomed. and in faux italian style (a bit like pronouncing campagnolo with an italian accent) we have become 'gruppo ciclismo (abbreviated to g.c.) ristorante debbie's'. you can laugh if you like, but it's hard to deny the coolness factor that such a finely honed jersey confers upon the wearer. and not only does the decor pay homage to the home of the giro, but the fit has also been inherited from the nation of coppi, bartali and pantani, favouring the slim of figure and offering what we like to call a race fit. however, in the modern age and ever mindful of a velominati rule that may have inadvertently escaped our committee meetings, i feel it is incumbent on the well-dressed to match bibs with jersey, at least as far as branding is concerned. thus i was more than happy to accessorise the new club jersey with a pair of shutt's excellent italian-made pro bib shorts, tastefully trimmed with their trademark rainbow colours at the hems of both legs. once again, the fit favours the slim, featuring mesh bibs that not only resist the temptation to cut into a pair of bony shoulders, but make for easy access should you happen to get caught short, if you see what i mean. the constitution of the red shutt logo'd pad appears particularly technical and i cannot deny a certain perceived 'bulk' when worn for the first time. however, all such apprehensions evaporate when in the saddle; after but a matter of kilometres it was easy to forget it was even there. after well over 100km of riding, my only quibble was a certain tightness to be noted where the black lycra joins the rainbow hems. 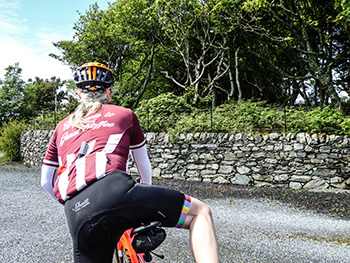 i did dismount with a couple of reddish areas on the lower thighs, but on subsequent rides this had all but disappeared, so perhaps i moan about nothing. 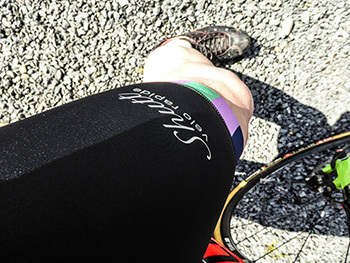 it is comforting to come across quality at this level from a british-based cycling apparel. in truth, there's little point in standing out from the crowd in any other manner. 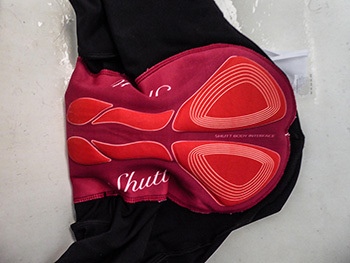 i can but commend, from our own experience, that you consider shutt vr when it comes time to commission your own custom clothing, but also the efficacy and style of their off the shelf bibshorts. don't be afraid to tell them we sent you.